Scars are a part of everyone’s life with individuals developing various scar marks in his/her course of life. Be it due to some kind of injury, insect bite, burn, chicken pox, acne, stretch marks or surgeries, scars are irritating and hard to deal with depending on their severity. While some fades out quickly, others may become permanent marks. No one wants to spend the rest of their life with scar marks. The pain intensifies if the scar is in some visible parts of your body. I am sure that you also have some experience of scarring and you may have tried a number of commercial products to remove scar marks in vain. But have you ever tried out getting rid of scar marks using natural home ingredients? 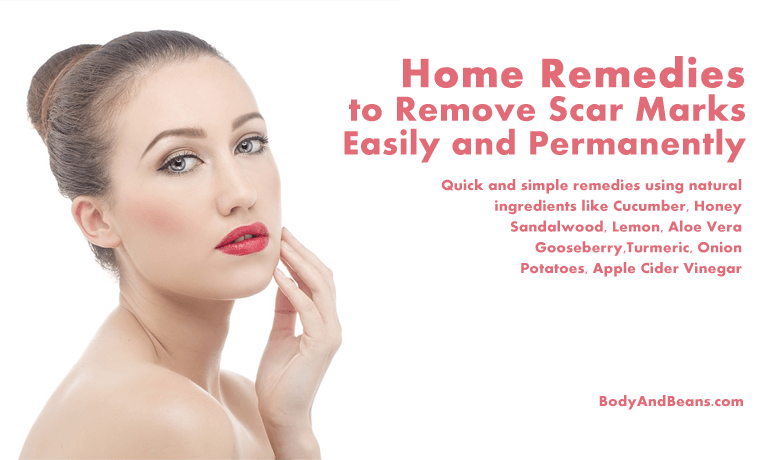 Well, you may not have thought of it but there are many effective home remedies to remove scar marks easily and permanently and I am going to discuss 13 best of them in my today’s post. If you want to discover these amazingly easy to apply remedies to remove scar marks, then continue reading this post till the end. Over the years, the perception of beauty has changed. Earlier where the facial features like eyes, nose, hair etc. were more stressed, nowadays a woman is considered beautiful only if she is perfect from all angles with the skin taking a significant part in it. In such a situation, having scars can completely diminish your beauty. It often harms the self-confidence of many young women and drives them to stress and some time depression. Scars affect the personality of any individual and hence it must be treated and removed as early as possible. Some scars may fade naturally but others may take time or may not disappear unless you treat it. I have seen many youngsters pricking, popping or squeezing the scars but that is not a good thing instead it worsens your scars. Therefore, the best option is to use natural home remedies to remove scar marks. These remedies are very cost effective as well as take minimal effort on your part to use them to remove scar marks. I will be talking about these surprising remedies to remove scar marks in details but before that, let me briefly talk about the types of scars depending on their causes of occurrence. Scars may be the result of several factors like acne, surgeries, wounds, diseases, etc. Depending on the cause of occurrence, these scars may be classified under five different categories. Here is how. Atrophic scars– These scars are the sunken marks that often creates identification marks on your skin. One significant example of an atrophic scar is the stretch marks. Hypertrophic scars– These are the most common form of scars. They are the raised marks that mainly occur due to acne breakouts or any kind of skin infection etc. Keloidal scars– Keloidal scars are the large, elevated, dark and benign tumors that mostly occur at the back, chest and behind your ears. They can sometimes grow outside your affected skin. Contracture scars– In case of burn, you may develop a contracture scar. They tighten skin that often hampers your ability to move. Sometimes, if the burn is severe, these scars may go deep and affect your muscles and nerves. Bruises– This is mainly a common skin discoloration that mostly occurs when the tiny blood vessels break after any traumatic injury. Now, that you know about the various types of scars, let us begin with the remedies to remove scar marks easily and permanently at home. Due to the advancement of science, there are many advanced methods to remove a scar mark but most of these treatments like laser treatment, anti-pigmentation therapy, derma-abrasion, cosmetic skin filling, surgical treatment etc. are so costly that most individuals cannot afford them. Also, most of them are chemical treatments which most people prefer to avoid. However, lucky for you there are natural ways and remedies to remove scar marks that you can try before giving up the hope of getting rid of scars. Baring a very few very severe scars, these remedies will work in most cases of skin scarring. Below are the top 13 most effective natural home remedies to remove scar marks easily and permanently. Many individuals may dislike onion due to its pungent odor but as far as the benefits of onions are concerned, not many will disagree to it. Reports have suggested onion to be great in removing scars. It is an anti-inflammatory agent that inhibits the collagen production that helps to fade the marks. In fact, as per research, onion is especially beneficial to remove the cosmetic appearance of postsurgical scars. So, you can easily try it out on your scars. Take an onion, grate it and extract its juice. Apply the solution on your affected akin and let it stay to dry naturally. Clean the area after 15 minutes. Use onion juice daily 3-4 times for significant and fast improvements. However, you must moisturize your skin in between the onion juice application. Since ancient times, honey has been used for several beauty benefits with the removal of scar marks being no exception. Honey has the ability to fade the marks and stimulates the regeneration of tissues. It, as per reports, is great in treating wounds as well. Mixing little amount of baking soda will intensify the good effects. It will exfoliate your skin, remove the dead skin cells as well keep your skin smooth and healthy. Take around 1 teaspoon of raw honey and baking soda each. Then massage the mixture on the scar for 3-5 minutes. After that, place a towel over the spot. Keep it until your towel cools. Clean the area then. This remedy, you may do twice daily for effective benefits. Well known as natural bleach, lemon is highly recommended when you have to lighten any kind of dark spot on your skin. It contains good amounts of AHAs (Alpha Hydroxy Acids) that removes the accumulated dead skin cells and thus fades away the old scars. 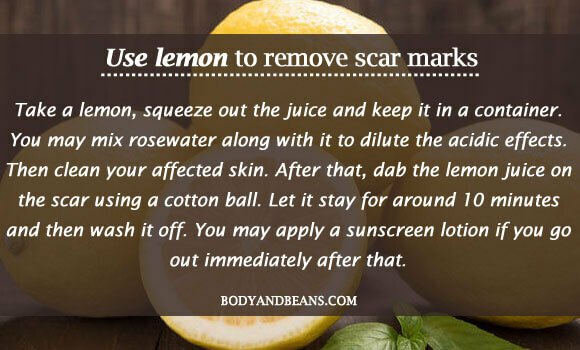 To remove the scar marks, you simply have to take a lemon, squeeze out the juice and keep it in a container. You may mix rosewater along with it to dilute the acidic effects. Then clean your affected skin. After that, dab the lemon juice on the scar using a cotton ball. Let it stay for around 10 minutes and then wash it off. You may apply a sunscreen lotion if you go out immediately after that. Repeat this remedy 2-3 times on a daily basis. Caution- There is no doubt about the skin-lightening properties of lemon but it is best to apply it on the old scars. Avoid applying on new wounds and scars. Also, if you have too much of a dry skin, you may skip this remedy. 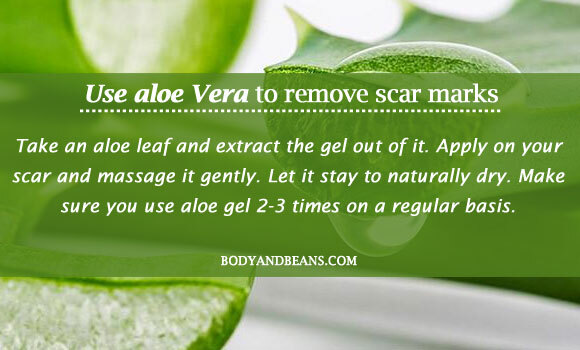 The skin benefits of aloe vera cannot be denied and now you can use it as one of the home remedies to remove scar marks easily and permanently. Several researches have proved it to be an anti-inflammatory agent that contains healing properties that is effective against burn injuries and several other wounds. Aloe vera can remove the scars as well as stimulate the regeneration of new skin cells. It may also give you protection against harmful UV rays and the subsequent skin damage that it causes. Further studies have also shown its effectiveness in treating pigmentation. Therefore, if your marks are due to it, you may use it any day to get rid of the darkness. The process of using aloe vera is quite simple. You simply have to take an aloe leaf and extract the gel out of it. Apply on your scar and massage it gently. Let it stay to naturally dry. Make sure you use aloe gel 2-3 times on a regular basis. 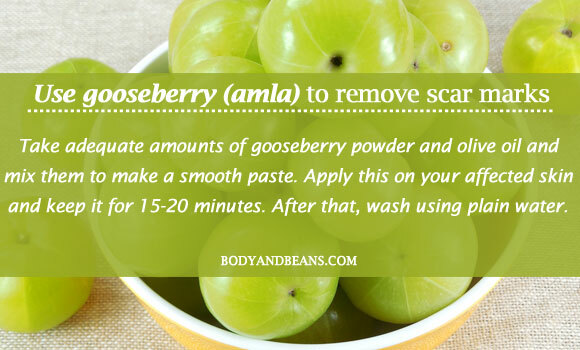 You can use gooseberry (amla) to remove scar marks easily and permanently. This is because gooseberry is rich in Vitamin C that as per studies is extremely beneficial as far as dermatology is concerned. It inhibits scar formation as well as lightens the old ones. Try to mix the nourishing olive oil with gooseberry to intensify the benefits. Take adequate amounts of gooseberry powder and olive oil and mix them to make a smooth paste. Apply this on your affected skin and keep it for 15-20 minutes. After that, wash using plain water. Use this pack on alternate days to get good benefits. If you have developed scar marks by some cut, burn or laceration you may use the combination of shea butter and coconut oil to keep the affected skin moist. This generally prevents the formation of scars and inhibits it from becoming deep and itchy. Both shea butter and coconut oil contains various antioxidants and omega-3 fatty acids that as per studies are beneficial to repair damaged skin and inhibit keloid scar tissue. Moreover, this paste is great for your skin as it keeps it moisturized as well as healthy. Take adequate amounts of shea butter and coconut oil to make a smooth paste. Then apply on your scars. Let it stay. However, be careful with your silk garments as it may stain them. Use this remedy 3-4 times weekly for the benefits. 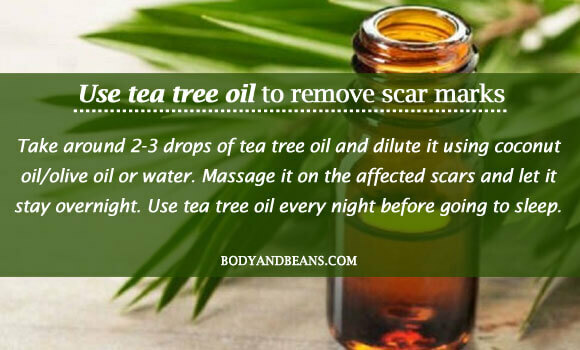 The usage of tea tree oil is one of the best remedies to remove scar marks easily and permanently. It is an antiseptic that is antibacterial, antifungal and antiviral in nature that proves to be very beneficial for your scars. As per studies, tea tree oil is mostly beneficial for healing hypertrophic scars that include your acne scars as well. It contains several photochemicals that improves blood circulation and also protects your skin from various infections. Take around 2-3 drops of tea tree oil and dilute it using coconut oil/olive oil or water. Massage it on the affected scars and let it stay overnight. Use tea tree oil every night before going to sleep. 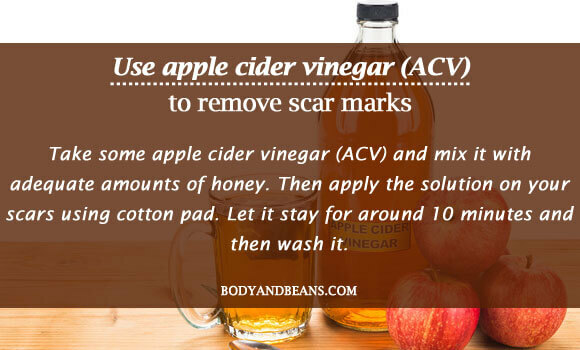 You can use apple cider vinegar (ACV) as a remedy to remove scar marks. It is an astringent and a natural disinfectant that can treat your scars. It is an antiseptic, which will help you treat infections as well. Apple cider vinegar (ACV) has the potential to eliminate dead skin cells and fades the scar marks. Since ACV is slightly acidic in nature, you can mix the moisturizing honey with it to dilute its effects. Take some apple cider vinegar (ACV) and mix it with adequate amounts of honey. Then apply the solution on your scars using cotton pad. Let it stay for around 10 minutes and then wash it. Use this remedy 2-3 times daily to get the good effects. 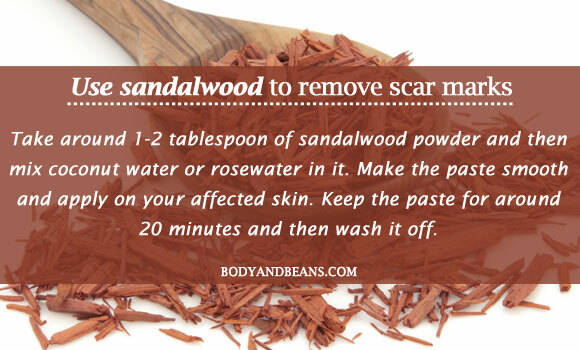 Sandalwood is an age-old remedy to lighten dark skin and you can remove the scar marks with it as well. It is one of the most skin friendly ingredients that suits most of the skin types. Sandalwood is anti-inflammatory and astringent in nature that is very effective to treat your skin problems. It is a soothing agent that eases your skin and makes it radiant. Take around 1-2 tablespoon of sandalwood powder and then mix coconut water or rosewater in it. Make the paste smooth and apply on your affected skin. Keep the paste for around 20 minutes and then wash it off. 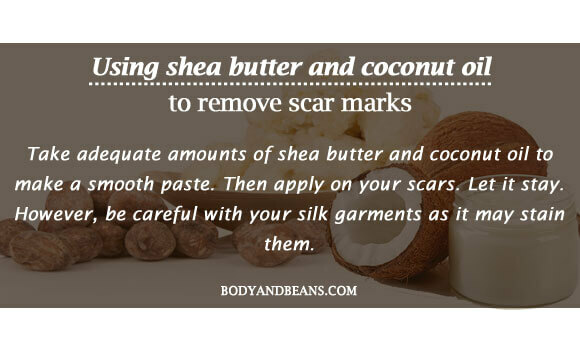 Use this remedy every alternate day to remove your scar marks fast. The list of home remedies to remove scar marks easily and permanently will remain incomplete without the mention of cucumber. Cucumber is great for all skin types and is very effective in lightening dark skin and the scar marks. Studies have shown the presence of phytochemical in it, that nourishes, cleanses and soothes your skin off the various infections. You can simply rub cucumber or apply cucumber juice on your scar. You can also mix the juice with some honey to get double benefits. There are many ways of using cucumber as I already said. In one method, apply cucumber on your dark skin or extract the juice and apply on your scar marks. Keep it for 20 minutes and then wash off. 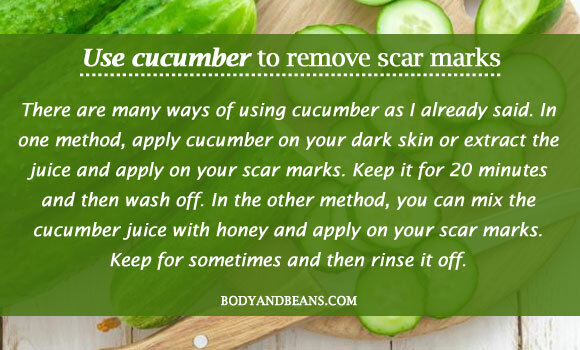 In the other method, you can mix the cucumber juice with honey and apply on your scar marks. Keep for sometimes and then rinse it off. Use cucumber remedy on daily basis to remove scars quickly. Eggs are not just good to taste and is healthy to eat, they are good for your skin as well. Egg whites contain good amounts of proteins and amino acids that tighten your skin as well as lighten the dark spots. It is believed to be a good cure for skin breakouts. So if you can tolerate the odor of the eggs then egg white might be a good option for you to recover your skin from the scars. Take an egg and separate the white from the yolk. Whip the whites to make it feathery. Now apply it on your affected skin using your fingers. You may use a cotton pad as well. Allow the egg white to naturally dry. Keep it for few minutes and then wash off with warm water. 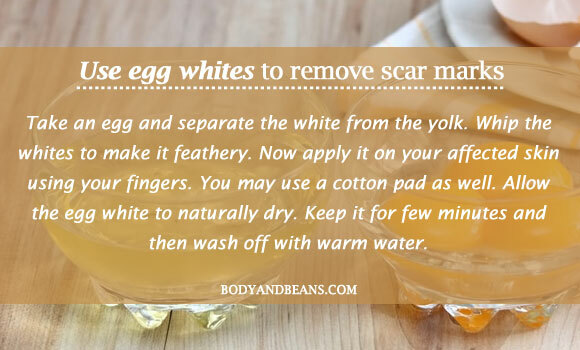 Use the egg white remedy two three times weekly to get rid of scars. Beauty and turmeric has an eternal connection and hence turmeric has been used in treating various skin problems since time immemorial. 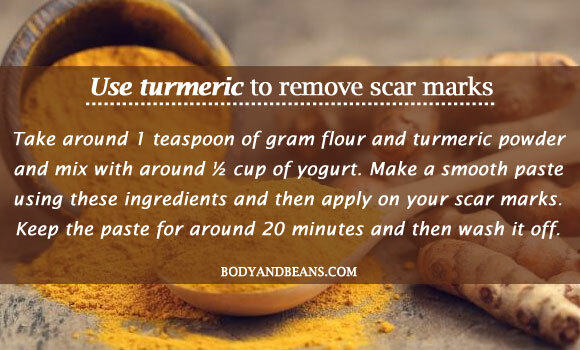 So, you can definitely use it to treat your scar and it is definitely one of the best home remedies to remove scar marks. It can lighten the dark scar marks and leave behind a healthy glow on your skin. Studies have shown that it is mainly the curcumin in it, which is instrumental in treating your skin problems. Turmeric also helps you get rid of the impurities and dead skin cells thereby making your skin clean and inhibits the occurrence of breakouts. Although turmeric itself is good for your skin, you may add little yogurt and gram flour to manifold the good effects. Take around 1 teaspoon of gram flour and turmeric powder and mix with around ½ cup of yogurt. Make a smooth paste using these ingredients and then apply on your scar marks. Keep the paste for around 20 minutes and then wash it off. This pack is very exfoliating and you may use it 4-5 times in a week for best results. However, when you are using turmeric try to be careful with your clothes as it may stain them. 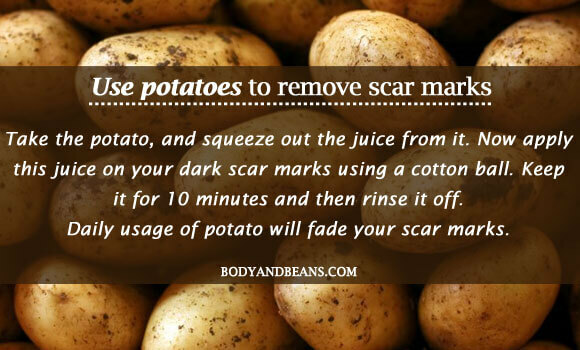 You can definitely use potatoes to get rid of your scar marks. Potato is a natural bleach that can lighten your dark marks and make your skin healthy and glowing. It can also cleanse your skin off the impurities and the dead skin accumulation that sometimes lead to skin darkening and acne breakouts. 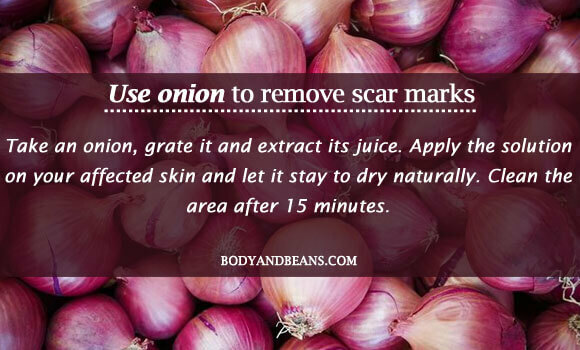 So, besides using it for your culinary purposes, try to use it to deal with your scar marks. There can be two methods of using potatoes on your scar marks. In one method, you can simply take a potato and slice it into small pieces. Then rub the slices on your scar marks gently. Continue for some time and then wash off. Alternatively, you may take the potato, and squeeze out the juice from it. Now apply this juice on your dark scar marks using a cotton ball. Keep it for 10 minutes and then rinse it off. You can use any of the remedies as both give similar effects. Daily usage of potato will fade your scar marks. Which is your fav remedy to remove scar marks? Skin problems have become a common thing nowadays. Be it due to pollution to certain accidental injury to surgeries that we have to undergo, scars are almost an inevitable consequence. It is hard to deal with scars but what’s more frustrating is the mark that they leave behind. Although we cannot always prevent accidents but we have definitely remove the scar marks easily until and unless they are too severe. There are many clinical treatments to beautify your skin but these are limited to only a handful section of the society. Most of the people cannot afford them. Therefore, for majority of us, it is best to go the natural way. 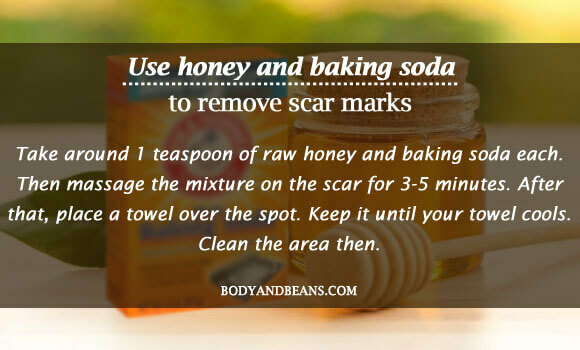 There are several natural home remedies to remove scar marks easily and permanently. Ingredients like lemon, onion, cucumber, turmeric, sandalwood, aloe vera etc. are easily available and their method of application is also very easy. All of them are very good for your skin. You only have to use the right technique to reap the maximum benefits. However, there is no denying of the fact that the home remedies to remove scar marks are very effective, but not all scars are same or not all of you have similar skin types, so it is better if you do a patch test before using them. Also, it is advisable that you do not use them upon new wounds. Although some of them have medicinal properties but just for your own safety, try to use these only on old scars to remove the marks. For severe scars, it is advisable that you take doctor’s help and follow his advice. Are you worried about your scar marks? Have you tried many method but all in vain? Have you ever felt like trying out the home remedies to remove scars easily and permanently? Well, check out my list of 13 ingredients and use any of them that suit your skin type. Share your feedback after using and do not forget to recommend others if you yourself get the benefit. Also, like, comment and share the article if you find it beneficial. Until then stay healthy, stay gorgeous and say bye to scar marks forever. Great article! These are the best remedies to get rid of the scar. 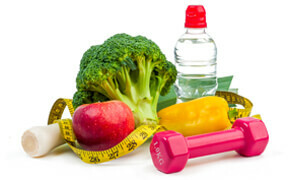 Home remedies are best to work wonderfully and we can access them easily. Thanks and keep sharing.